Cook your noodles according to the package instructions. Set aside. Heat a tablespoon of oil in a large wok and saute the shrimp until it is cooked through. Remove the shrimp to a plate. Heat the rest of the oil in the wok and saute the garlic, ginger, and hot pepper for several minutes, stirring constantly. Add the zucchini and cook for 2-3 more minutes. Push the contents of the wok to one side to make room for the eggs. Add a touch more oil if necessary, and add the eggs. Scramble the eggs, stirring constantly, until they are just cooked through. Add the sauce to the pan, and heat it up, then add the noodles and shrimp to the pan and toss everything together thoroughly. When it's all icombined and hot, add in the cilantro and scallions and toss again. 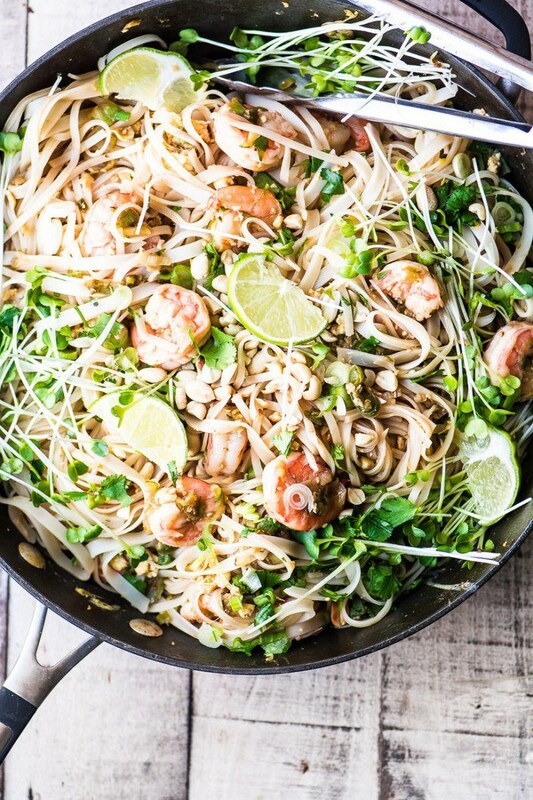 Serve topped with roasted peanuts, sprouts, and lime wedges.